With the final debate behind them, Trump and Clinton now have only weeks left before the election. With less than 15 days left to vote, the final presidential debate was held at University of Nevada, Las Vegas, NV October the 19th. The candidates’ positions have been fully explored over the past months, with the only new information being another set of leaked Hillary Clinton emails and more accusations of sexual assault leveled against Donald Trump. Clinton is a standard Democratic representative who has positioned herself as a champion for women, minority rights, and the American people. Trump’s candidacy, an unorthodox approach, promises a presidential agenda that will reshape domestic and global politics. The main questions asked were for the candidates to clarify statements they had already made and explain rumors made by others, or to further elaborate on the policies they plan to enforce. The debate started out in a professional manner, but as with the other two debates, it eventually had candidates focused less on the issues and more on undermining each other’s character and candidacy. When asked about abortions and the Supreme Court’s rulings, Trump had switched the subject on Justice Ginsburg and her performance overall while citing traditional Republican rhetoric trying to explain his stance against abortions. “…what Hillary is saying in the ninth month you can take the baby and rip the baby out of the womb of the mother just prior to the birth of the baby,” said Trump, rebuking Clinton’s position on abortion. Meanwhile, Clinton was asked about her exposed emails via WikiLeaks. She addressed the question briefly and then pivoted towards foreign intelligence trying to interfere in the election. “But you are very clearly quoting from WikiLeaks, and what’s really important about WikiLeaks is that the Russian government has engaged in espionage against Americans,” countered the former Secretary of State. When Trump called this out as a diversion from the question, Clinton responded by bringing up the cozy relationship her opponent allegedly has with Russia and Vladimir Putin. Regarding immigration, the Republican nominee made his most noticeable statement. “We have some bad hombres here, and we’re going to get them out,” stated Trump. He reiterated his stance on deportation, his proposed immigration ban, and the need for a wall along the U.S.-Mexican border. When Trump’s sexual assault allegations were brought up, he completely denied them. One of the most poignant moments was when the candidates were comparing their experience and Clinton talked about her 30 years of experience in domestic and global affairs, which holds a great contrast to Trump’s 30 years of philanthropy and celebrity. The last segments of the debate had Trump suggesting that the media was corrupt and that if he lost, it would be because the election was rigged. Clinton, on the other hand, was giving a rather standard, diplomatic response about Social Security when she managed to bring up how the wealthy’s taxes will be raised. She went as far as to say that both her Trump would pay their share, unless he finds a way to avoid them, as he has done in the past. At this comment, Trump could only call her a “nasty woman,” but Clinton was unfazed and finished her argument on the matter. Clinton’s message throughout her campaign has been focused around her plans to invest in middle America, to work with other countries and form alliances, and to be a strong leader for all different types of Americans. Chris Wallace, the moderator for the debate, was professional and managed to reign in the candidates when they swayed from the topic. While the beginning of the debate was professional, it quickly turned into off topic facts being thrown at each other. 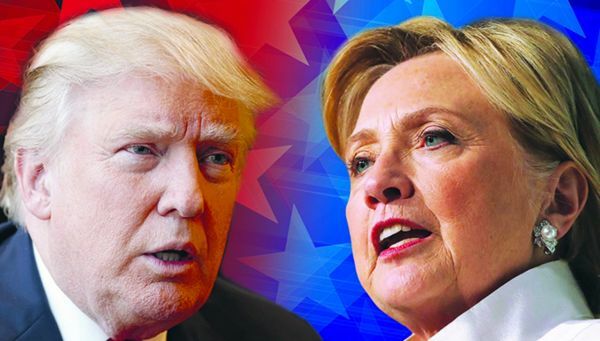 This year’s presidential debate is a choice between two candidates that are revolutionary in their own rights, both of whom could drastically change the future of America.